CINCINNATI — A proposed mixed-use trail cutting through Westwood will get the lion’s share of bike program funding in 2017, if council approves the city administration’s recommendations. As part of a series of memos outlining his budget update proposals for 2017, City Manager Harry Black released a breakdown of bike program funding recommendations. Of more than $750,000 in city funds that would go to bike projects in 2017, about $400,000 — or roughly 53 percent — will go to the .58-mile Westwood Trail project, which would connect the Dunham Recreation Center and existing, adjacent Dunham Trail — also slated for renovation in anticipation of the Westwood Trail — to the Western Sports Mall via off-street trail and along Ferguson Road. In addition to city funds, a $500,000 Transportation Alternatives grant, secured through the Ohio-Kentucky-Indiana Regional Council of Governments, will go toward the project. Officials and stakeholders hope the trail can continue to track westward in future phases, but sources of funding for further extension have not been announced. 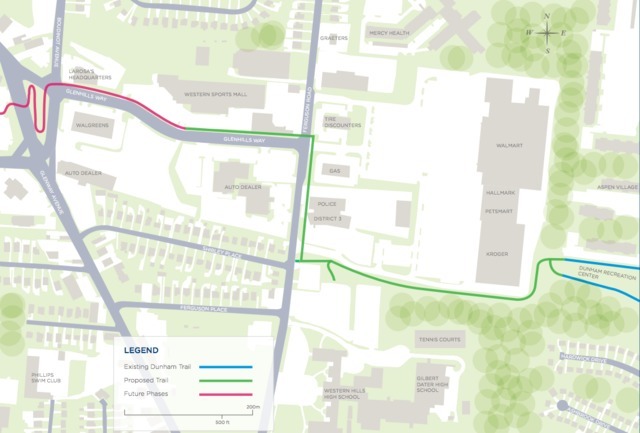 The budget proposal also includes money for the much-anticipated Wasson Way mixed-use trail project, in the form of a $166,700 match for another $500,000 Ohio Department of Transportation Natural Resources Clean Ohio Trails grant secured last year. The Wasson Way trail, once completed, would connect Norwood to Mariemont, via multiple east-side Cincinnati neighborhoods. As with any budget item, these figures have been sent to Mayor John Cranley for review and revision, before going before full council for a vote. Follow Pat LaFleur on Twitter ( @pat_laFleur ) for all things bicycling and living car-free in Cincinnati and Northern Kentucky.